Why Chamomile? | EAT MY PLANTS! Many Americans who drink too much coffee, eat sweets, and have irregular nutritional habits, have acid reflux and constant irritation. If you’re like me and really don’t like taking any medication, a friend suggested I drink some Chamomile tea. This might work for you, too. Instantly, I became a believer. I was shocked at how quickly my stomach settled, though I really didn’t like the taste. I started drinking Chamomile tea rather regularly and the flavor really grew on me. My first experience was with loose leaf Chamomile, if you call it that, since it’s not leaves at all, really. It’s the flower, dried and ground. My friend let me take his stash home with me and I finished it off within the week. I grabbed some generic, organic variety at the local grocer that came in individual little bags but noticed a difference in the flavor and potency right away. I was using 4 bags in each cup. Turns out, similar to how I like dark beer, dry, red wine, and rich, bold coffee, I like Chamomile tea really strong as well. So, I decided to find out if I could grow it easily here in Western New York. I certainly can. 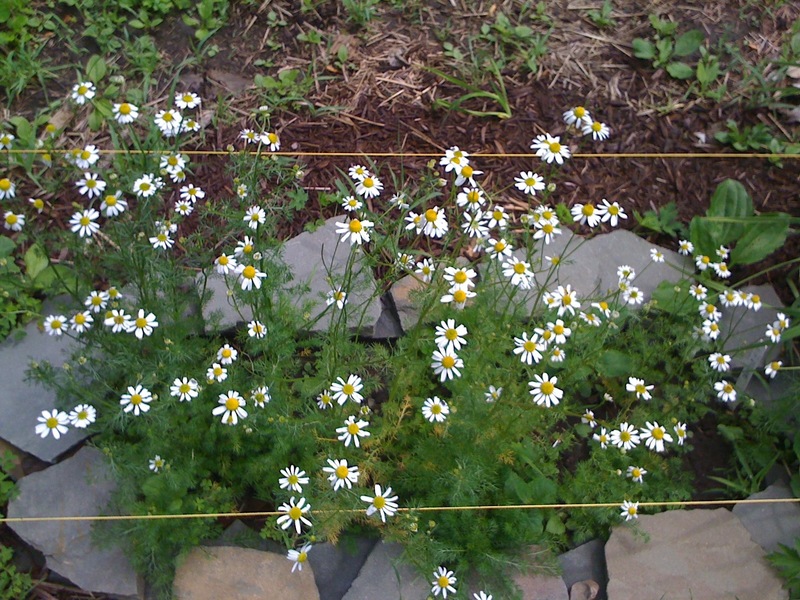 I bought some organic, German Chamomile this past Winter and when the last hard frost had passed, I selected a small spot in my garden for it. It germinated in about a week and I had to be sure to pinch off any weeds that were competing for space. About a month later I started to see buds and week after that I was already picking flowers off. The more I picked them the faster and more furious they would grow. I believe that these will reseed themselves for next season if I let them. When they appear to be dying back, I’ll let the last seeds fall to the ground and I’ll even collect some as well, just in case. As soon as I pick them, I bring them in and place them on a cookie sheet. I heat the oven to 170 degrees, the lowest it can go, and turn it off as soon as it heats up. I also leave the door cracked for circulation. A few hours later I go back and repeat the process. If the flowers aren’t dry by that point, I simply do it again. 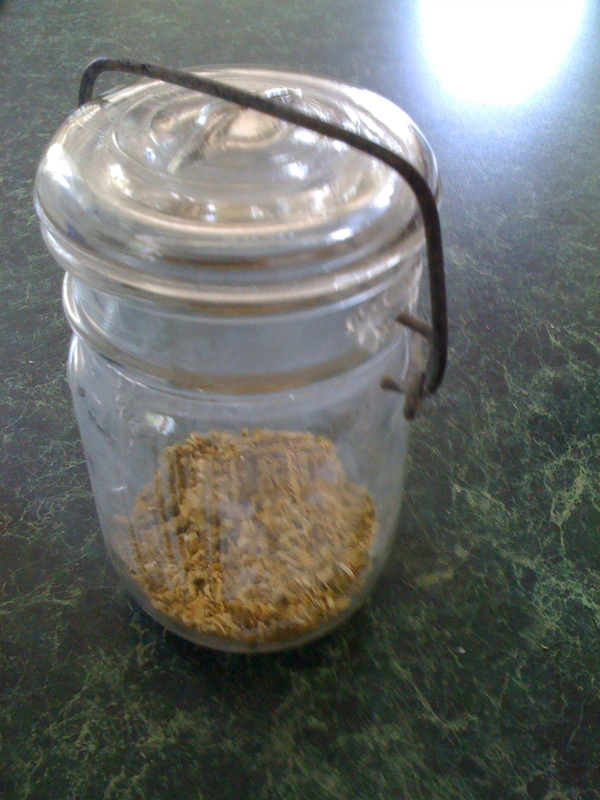 I’ve been saving the dried, ground Chamomile in this locking, Mason jar. It’s perfect for the job and can be found at many different grocers and retail stores for cheap. You can even find them on ebay. WebMD lists a large number of other uses that I was not aware of, most or all of which I do not have. They say it can relax you as well, which I can’t say whether or not I noticed. There are few side effects or concerns with regards to drinking or eating Chamomile either, so it’s really safe for most people but check before you indulge if you’re not sure. Chamomile tea can be used as a mild fungicide for your young seedlings, but I’ve yet to need it so I haven’t used Chamomile for that. When the seedlings are young and the soil is kept moist, fungus can easily grow on the surface. Chamomile sprayed lightly over them can help combat that. Pretty cool. Give it a try. It’s actually really easy and quite rewarding. Buy organic German Chamomile seeds here. I did. It’s cheap and easy to grow. Maybe next season I’ll add a Roman Chamomile bed and compare them. July 17, 2013 in Chamomile.